The Chart of Hand Tools « Adafruit Industries – Makers, hackers, artists, designers and engineers! 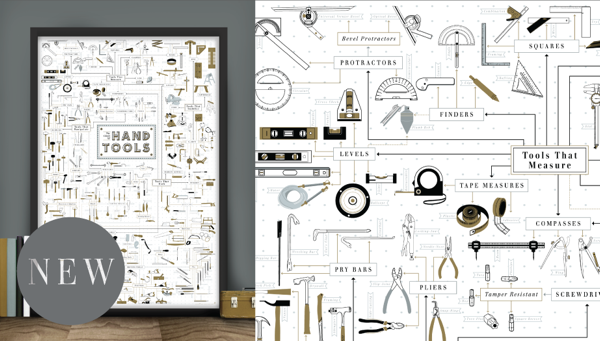 With over 300 meticulously illustrated tools this chart celebrates the tinkerers and the doers: those who build, repair, and create. Breaking down all manner of hand tools by their basic function, this sprawling print covers the most basic, such as the humble yet mighty hammer, to the most highly specialized, such as the 24 types of files depicted here. A hand-crafted compendium of ingenious and essential devices, this chart is a complete cut-list of the tools that empower makers and artisans. And even better, the chart is printed with brass and aluminum metallic inks to give it a shop-ready sheen.